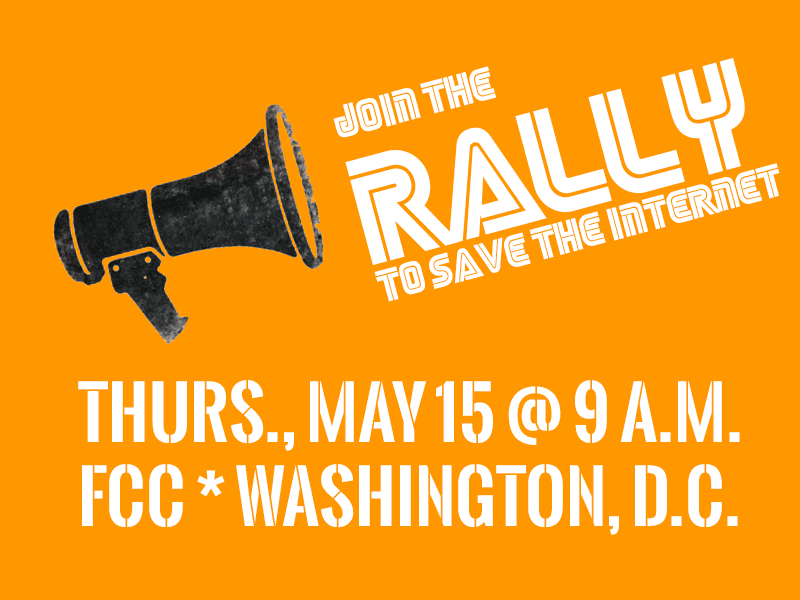 At 9 a.m. in Washington, D.C., we’ll hold the Rally to Save the Internet. Sign up to RSVP. Yes, I want to join you in D.C. Send me more information. I’m interested in participating in other actions. Send me more information. When: Thurs., May 15, 9–10:30 a.m. The nationwide drumbeat in support of Net Neutrality has gotten louder and louder — and on May 15th we’ll bring the noise to the FCC’s doorstep. Activists, organizations and companies around the country will participate in a day of action online and off to oppose the FCC’s plan to allow rampant discrimination online. Together we’ll dance, drum and shout that the agency must throw out its destructive plan and reclassify broadband as a telecommunications service. This is the only way to restore real Net Neutrality. The FCC’s plan would allow companies like AT&T, Comcast and Verizon to create a two-tiered Internet, with a fast lane for those who can afford it — and a dirt road for the rest of us. Sign up on the right to RSVP for the Rally to Save the Internet. P.S. A generous donor will match all funds if we reach our goal of raising $50,000 to save the Internet. Help us get there. Thank you!